Jonathan Fishman, Robin Youngs, Edward Fisher, Musheer Hussain,	The Journal of Laryngology & Otology, Volume 130 Issue 11, pp 981-982. B Hitchcock, S Moynan, C Frampton, R Reuther, P Gilling, F Rowe,	The Journal of Laryngology & Otology, Volume 130 Issue 11, pp 983-989. L K Reckley, S A Song, E T Chang, B B Cable, V Certal, M Camacho,	The Journal of Laryngology & Otology, Volume 130 Issue 11, pp 990-994. M Khalid-Raja, K Tzifa,	The Journal of Laryngology & Otology, Volume 130 Issue 11, pp 995-1000. X-G Ni, Q-Q Zhang, G-Q Wang,	The Journal of Laryngology & Otology, Volume 130 Issue 11, pp 1001-1006. M J Polonenko, S L Cushing, K A Gordon, B Allemang, S Jewell, B C Papsin,	The Journal of Laryngology & Otology, Volume 130 Issue 11, pp 1007-1021. M Gorham-Rowan, R Morris,	The Journal of Laryngology & Otology, Volume 130 Issue 11, pp 1022-1032. Does spectacle use lead to vestibular suppression? A Thakar,	The Journal of Laryngology & Otology, Volume 130 Issue 11, pp 1033-1038. A W Van Der Wal, P J A M Van Ooij, J A De Ru,	The Journal of Laryngology & Otology, Volume 130 Issue 11, pp 1039-1047. O T Dale, S Sood, K A Shah, C Han, D Rapozo, H Mehanna, S C Winter,	The Journal of Laryngology & Otology, Volume 130 Issue 11, pp 1048-1053. M Bhutta, R Mandavia, I Syed, A Qureshi, R Hettige, B Y W Wong, S Saeed, J Cartledge,	The Journal of Laryngology & Otology, Volume 130 Issue 11, pp 1054-1058. A T Sayit, H P Gunbey, B Fethallah, E Gunbey, E Karabulut,	The Journal of Laryngology & Otology, Volume 130 Issue 11, pp 1059-1063. V S Nesic, V Z Djordjevic, V Tomic-Spiric, Z R Dudvarski, I A Soldatovic, N A Arsovic,	The Journal of Laryngology & Otology, Volume 130 Issue 11, pp 1064-1071. 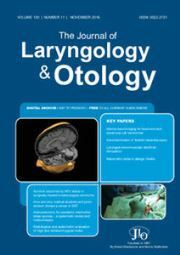 A K Sahoo, C Preetam, R Kumar, D K Samal,	The Journal of Laryngology & Otology, Volume 130 Issue 11, pp 1072-1073.